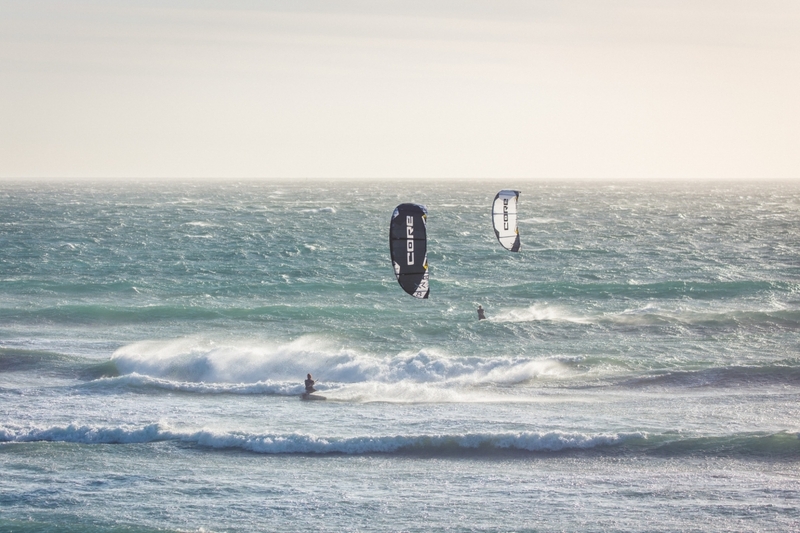 You are here: Home / Uncategorized @en / How much wind does it take to learn kitesurfing? Planning a complete kite holiday on your own is not that easy. Not only the right spot and the right equipment are essential for kitesurfing, also the prevailing wind and weather conditions have to be considered. Especially if you are still at the beginning of your kite career, it can quickly become confusing if the knots suddenly have nothing to do with a rope and Beaufort does not mean a city in France. In order to bring some light into the darkness, we have collected all information relevant to wind and kitesurfing. If you are also a beginner kitesurfer and would like to learn more about kitesurfing in general, you should definitely have a look at our kitesurfing learning guide. If you are travelling on our website and it is about the description of the wind speeds, you will frequently be referred to the abbreviation “Bft.”. (Beaufort). This is the Beaufort scale originally developed by the British admiral Sir Francis Beaufort for seafaring to determine the behaviour of waves on the sea. Nowadays this calculation is used by most sailors, surfers or kitesurfers to measure wind speed. The scale divides the wind into twelve strengths – from complete calm (0) to hurricane (12). For the kitesurfer it becomes really interesting only starting from 4 Beaufort. At this wind force the sea is slightly moved, a moderate breeze blows and the first kitesurfers can venture onto the water with a large kite and board. With the Foilboard you can even go kiting from 3 Beaufort. This wind range is reserved for experts only, because with so little wind the biggest challenge is to get the kite into the air. Beginners should therefore stick to 4-5 Beaufort. The wind speed can be given in knots instead of Beaufort. Knots is a speed measure that also comes from shipping and is based on one nautical mile. A knot corresponds to the equivalent of 1.852 km/h and is exactly one nautical mile. For example, 7 to 10 knots in wind force means 3 Beaufort. From approx. 10 to 11 knots – this is the limit between 3 and 4 Beaufort – kitesurfing is basically possible. Kitesurfing is really fun for beginners from about 14 knots (4 Bft.). If the speed reaches 30 knots (6 Bft. ), beginners will have to struggle at the latest. Pro kitesurfers, on the other hand, will be happy if the scale shows more than 35 knots, because then new height records can be achieved again. From about 40 knots (8 Bft.) 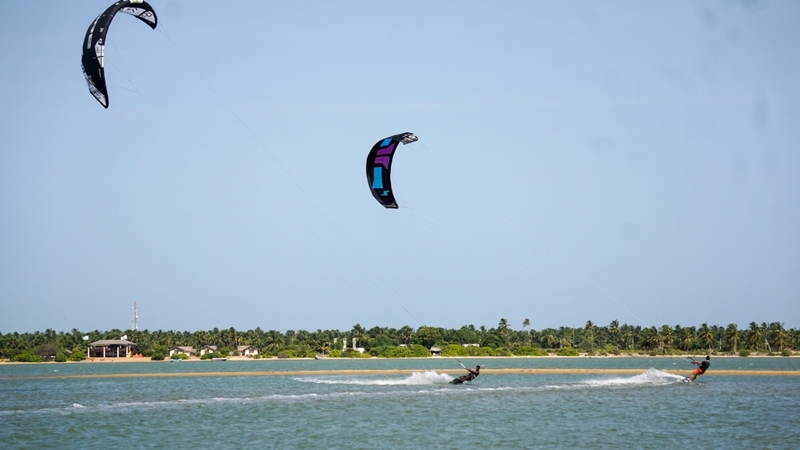 the majority of kitesurfers will leave the water and from 50 knots (9 Bft.) it will definitely become unkiteable. The terms onshore, sideshore and offshore refer to the wind direction in relation to the coastline (“shore”) and thus characterise the surfing conditions. For beginners and intermediate surfers the best is a constant wind, which comes parallel to the shore (side-shore) or diagonally onshore (side-on-shore). If something goes wrong during take-off, you will not be pulled directly to the shore. 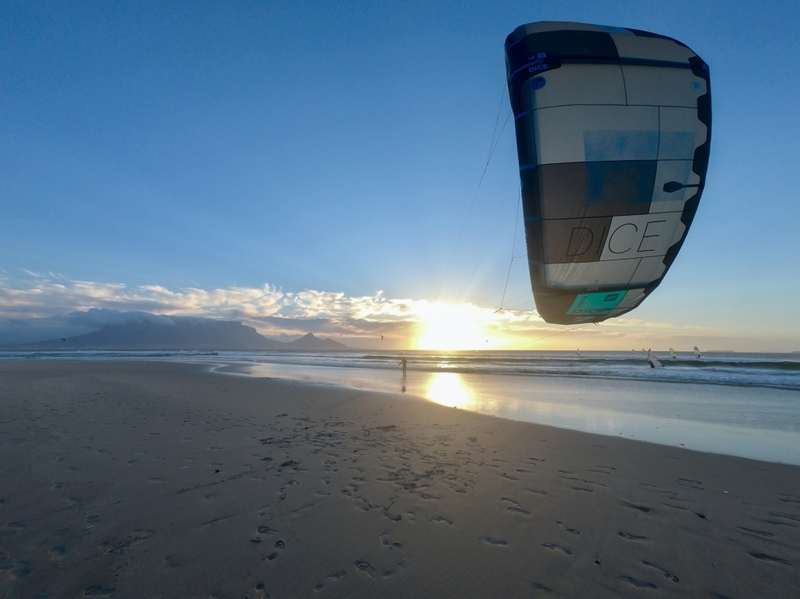 Since kitesurfers ride at an average right angle to the wind direction, the kitesurfers always ride away from the shore and then back to the shore when the wind is side-on-shore or side-on-shore. This way everything is distributed better on the water. And if something happens to you further out, you don’t drift further out, but parallel to the shore, or even slowly towards the shore when the wind is onshore. Onshore conditions often go hand in hand with shorebreak, which makes kitesurfing much more difficult. Onshore conditions are especially problematic for kitesurfers because there is a danger of being pulled over land uncontrolled. 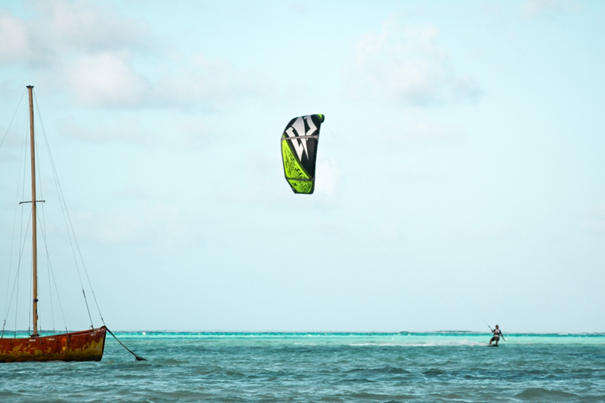 Wind- and kitesurfers have to gain a lot of height together to move from the shore to the open water. However, the wind can usually fall in completely freely and is therefore constant. Offshore wind (offshore) is also generally discouraged from entering the water. Offshore wind has the disadvantage that it comes directly over the land, has to overcome obstacles and is therefore often very gusty. In addition, there is the danger of abrading in offshore winds and this happens faster than you think. You don’t even have to fall, often it is enough that the wind calms down and you don’t come back to the shore. In this case you would have to swim against the wind direction, which is very difficult or almost impossible, especially with kite equipment. With offshore wind you should only go if you are no longer a beginner and can safely ride upwind. By the way: we always pay attention to the wind conditions and the spot at our destinations. For a safe and relaxed kitesurfing holiday, please contact us for advice. https://www.kiteworldwide.com/wp-content/uploads/2019/01/KWW_LOGO_BRAUN.png 0 0 Josie https://www.kiteworldwide.com/wp-content/uploads/2019/01/KWW_LOGO_BRAUN.png Josie2019-03-19 13:51:012019-03-19 14:41:18How much wind does it take to learn kitesurfing?